BATON ROUGE — An impending vacancy on the Louisiana Supreme Court caused by the resignation of Chief Justice Kitty Kimball later this year has left the philosophical direction of the court hanging in the balance and local judges and attorneys scrambling. Eight candidates are seeking the seat, including four Court of Appeal judges, two District Court judges, and two local attorneys. Meanwhile, many lawyers who often contribute to judges’ campaigns are sitting on the sidelines, afraid to contribute to any candidate, lest they offend the others. Judge John M. Guidry is considered the leading Democrat, but many attorneys believe the top Republican vote-getter in the Nov. 6 primary will be the eventual winner in the Dec. 8 runoff. Republican leaders are equally concerned that the large number of Republican candidates could so split the Republican vote in the primary that two Democrats — Guidry and Baton Rouge attorney Mary Olive Pierson — could slip into the runoff together. In a race where each candidate wants any edge he can get, the endorsement of the Republican Party of East Baton Rouge Parish has loomed large, and that endorsement went to Court of Appeal Judge Toni Higginbotham and District Judge Tim Kelley on Wednesday (see story on Page 6). • Court of Appeal Judge Toni Higginbotham. Conservative Republican. Long-time Republican activist with seven years practicing law, 14 years as Juvenile Court judge, and two years as judge of the Court of Appeal. Endorsed by Republican Party. Resides in South Baton Rouge. • Court of Appeal Judge Jeff Hughes. Conservative Republican with 12 years as practicing attorney, 14 years as District Judge, and eight years on the Court of Appeal. Resides in Livingston Parish. • District Judge Tim Kelley. Conservative Republican with 21 years practicing law and eight years as District Judge. Endorsed by Republican Party. Resides in South Baton Rouge. • District Judge Bill Morvant. Conservative Republican with 11 years as a practicing attorney and 15 years as District Judge. Endorsed by Louisiana Association of Business and Industry. Resides in South Baton Rouge. • Court of Appeal Judge Duke Welch. Conservative Republican who served in the U.S. Air Force. He served on the Baker City Council, practiced law for 15 years, served as District Judge for nine years, and has served for eight years on the Court of Appeal. Resides in Zachary area. • Court of Appeal Judge John Michael Guidry. Moderate Democrat. He served in Louisiana House of Representatives and Louisiana Senate, practiced law for 10 years, and has served for 15 years on Court of Appeal. He resides in Baton Rouge. • Mary Olive Pierson. Democrat. She has practiced law for 42 years representing a wide variety of clients but is well known for high profile cases including multi-million dollar civil cases and white collar criminal cases. Served on the City-Parish Council. Resides in South Baton Rouge. • Jeffry Sanford. Independent. He has practiced law for 21 years and has a wide-ranging practice that includes multi-million civil cases, international law, professional sports, and many others. Why the Election Matters. The Louisiana Supreme Court is a largely collegial group which often agrees, but there are some deep philosophical issues which split the court down the middle. Speaking generally, the court has three conservative justices, three liberal justices, and one who can tilt either way, depending on the issue. The election of a Republican to this seat would move the court in a more conservative direction because Chief Justice Kimball is considered more liberal. Because the philosophical direction of the court is at stake, the election has attracted a large number of candidates and a great deal of interest from the legal community, especially trial lawyers, and the business community. • The primary election is Nov. 6, and the runoff is Dec. 8. It is extremely unlikely that the election will be resolved without a runoff. • All of the six judges seeking the post are considered capable and well qualified. • Court of Appeal Judge John Michael Guidry is viewed as the candidate most likely to run first in the primary. Although black and a Democrat, he is considered moderate to somewhat conservative. He enjoyed the support of LABI when he ran for the Court of Appeal and was opposed by former Sen. Cleo Fields. 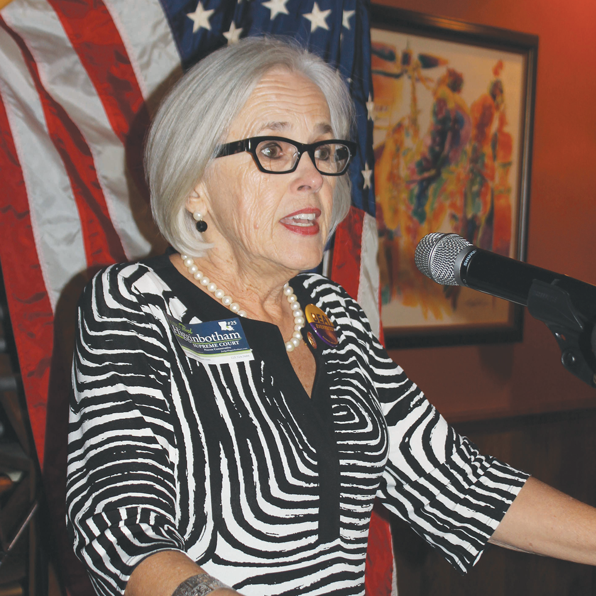 • Democrat attorney Mary Olive Pierson has an outside chance of making the runoff, if she has a strong media campaign and if the Republican field splits evenly. However, few observers expect that to happen. • District Judge Bill Morvant secured the coveted LABI endorsement and is expected to be well funded, which could provide him with a strong media presence in the final weeks of the campaign. • Court of Appeal Judge Toni Higginbotham received a lot of media exposure in her election campaign for the Court of Appeal two years ago, and this name recognition is still relatively fresh. • District Judge Tim Kelley has name recognition from the same race for the Court of Appeal two years ago. Both he and Higginbotham have been endorsed by the Republican Party, and this is expected to provide them with a political advantage with Republican voters and an organizational edge. • Court of Appeal Judge Jeff Hughes is the only candidate from Livingston Parish, which has a large percentage of the white voters in the district. If he can hold those voters together, he has a reasonable chance at the runoff. • Court of Appeal Judge Duke Welch is the only candidate from the north part of the parish, which provides him with an important geographic base. Although a conservative, he is a recent Republican. Some trial lawyers may gravitate to Welch as the most acceptable Republican. • The largest percentage of Republican voters are found in South Baton Rouge, but three candidates are expected to split these votes — Higginbotham, Kelley, and Morvant. • Two women in the race — Higginbotham and Pierson — may benefit from their gender. • Supreme Court candidates are forbidden from soliciting funds for their campaigns. Each candidate has to have a separate committee to raise and spend funds. This makes fundraising more difficult. • No polls have been taken and publicly released on the race. So everything one hears about who’s ahead is basically speculation. For updates on the Louisiana Supreme Court and other races on the Nov. 6 ballot, “Like” Central City News on Facebook and read the Election Guide in the Oct. 18 edition of the Capital City News.